Jill Tregemba, a graduate of the University of Wyoming and rancher, is proud of her school and the heritage of the western way of life. One faculty member at the University of Wyoming does not agree that "The World Needs More Cowboys." The Laramie Boomerang in Laramie, Wyo., reported that associate professor Christine Porter believes the slogan will "embarrass" the university outside the state of Wyoming and the Rocky Mountain west and lacks inclusivity for those who "identify as female." The new slogan, released by the university to attract more students from Wyoming and outside the Cowboy State, has drawn the support of the agriculture industry. The Wyoming Stock Growers Association was among the first producer group to issue a statement, saying they were "saddened that some UW faculty are apparently unable to see beyond the literal image of the cowboy" and that they are "equally proud of the much broader meaning that is attributed to the 'cowboy' in modern day Wyoming. Our citizens of all occupations are admired for approaching their work and their lives with the 'cowboy spirit' of determination, commitment and honesty." The woman who wears the crown and represents the state of Wyoming as Miss Rodeo Wyoming, a title currently held by Morgan Wallace of Laramie, understands the culture she represents. Crystal Myers, Miss Rodeo Wyoming national director and a former Miss Rodeo Wyoming herself, said she is disappointed in the argument surrounding the slogan. According to Myers, whichever young woman wears the crown represents the Cowboy State and must embody professionalism, intelligence, style and everything positive about the Western lifestyle and the sport of rodeo. "She represents the state of Wyoming but within that, she represents what our state stands for," Myers said. "That's the western lifestyle, western heritage, and the agricultural industry which is an integral part of the state." The heritage, which is embodied by the cowboy image, she said stands true to the code of ethics familiar to those in the ranching lifestyle. The Code of the West, which appeared in Jim Owen's book, Cowboy Ethics — What Wall Street Can Learn from the Code of the West, includes the ethical standards so many hold themselves to. Owen's code became the basis for the Wyoming State Code, written into law in 2010. Kent Noble, who is the executive director of the Center for the Cowboy Ethics and Leadership is a past assistant dean of the University of Wyoming College of Business. The Code of the West, which has appeared on the university's website, is what caught the eye of Morgan Wallace. 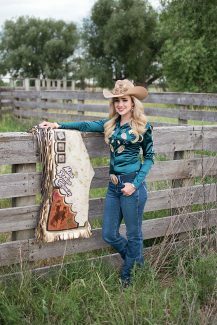 Wallace, a senior agriculture communications student plans to attend law school in Laramie though this year will be spent traveling the country as Miss Rodeo Wyoming. When Wallace first heard the slogan, her impression was the meaning was rooted in a literal sense that the world needs more Wyoming Cowboy students and fans. "As Miss Rodeo Wyoming, I get to travel all across the nation and represent Wyoming, which is known both as the Equality State and the Cowboy State," she said. "I think it's amazing that we can be called by both of those names." Wallace said one of the jobs of the Miss Rodeo Wyoming Association is to create young women who understand the greatness of the state and what the woman behind the crown represents. "We were the first place in the entire world to allow women to vote, we were the first place in the country to have a female governor, and Laurie Nichols is the first female president of the university," she said. "I think we have done a lot as far as equality for women and the state of Wyoming should be proud of that." Social media posts supporting the University's choice, including a Facebook profile picture frame touting the UW Cowboy, abound. Jill Tregemba, a graduate of the university, posted her support of the slogan and the heritage the cowboy name evokes. "I'm proud to be a cowboy alumni," she wrote. "I know other cowboy grads that aren't everyday put on their boots and take care of cows kind of cowboys, but they are still Wyoming Cowboys. Let's be proud. Be proud of our heritage and quit trying to erase it." That heritage is the basis for a social media post Shelby Teague, Fort Morgan, Colo., made in support of the slogan. 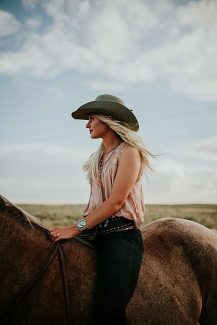 Teague, who graduated from the College of Agriculture at Kansas State University and was an accomplished member of the Meats Judging Team, returned to her family's farm and ranching operation following graduation. Teague cited the history of former slaves who found a better life on the range as cowboys and influenced cowboy culture. "The west and cowboy culture also had their fair share of women who added to the lore," Teague wrote. "Women like Annie Oakley, Calamity Jane and Pearl Hart defined women in the wild west. They refused to be defined by the cultural expectations of women at the time, and I think they would have (been) proud if today we saw them as "cowboys." Logan Milligan, a Torrington, Wyo., cowboy, said he didn't care what the university chose for its slogan but did care about the attack on what he called the "definitive word of my culture."